I have always enjoyed walking, bowling, playing softball when younger, dancing, and exercising. I belonged to many different fitness clubs and organizations over the years including Elaine Powers, Dance Slimnastics, Jazzercise, Olympic Fitness, Curves, and Zumba. I was a Curves member for several years when the centers in both Port Washington and Cedarburg closed. Needing another club to join, I checked out Anytime Fitness in October 2012. I remember meeting with Katie and being so impressed with the club. She was so warm and encouraging, I signed up that very day, only missing a few weeks due to a sciatic nerve issue in the past three years. I work out six days a week, three of those for strength training and weights, and three of cardio. I usually come in the morning and stay for an hour to hour and a half. 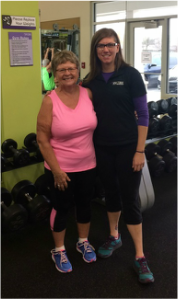 I meet with Jessica twice a month on the routines she prescribes for me for balance and strength. My cardio days include treadmill, elliptical, stationary bike, stair climber and row machine. I also do Zumba for my cardio days when it fits into my exercise schedule. My husband and I have been married for 39 years. He is very supportive of my desire to exercise. He understands what an important part of my life it is. We have four grown children who are my pride and joy. I taught grades kindergarten and first grade in the Port Washington/Saukville School District my entire teaching career (40 years) and still enjoy substituting at SES. I am very active volunteering with the Ozaukee County 4-H Organization, The Grafton Community Scholarship Fund, my church Women’s Guild, and other local organizations. Although a very busy lady, I always find time for Anytime! I appreciate so much all of the encouragement and support I have received from the Anytime staff, especially Jessica. She is helping with my nutrition. Too often I don’t eat well balanced meals. Then I get hungry and snack and grab treats throughout the evening. My downfall is dairy. If I could die eating ice cream I would be a happy camper. I am so fortunate not to have any health issues at all and contribute it to inheriting my mother’s good genes and my exercise routine. I know I have become much stronger and healthier. It is evident when doing heavy lifting, climbing many steps, dancing, participating in active Zumba, and the stamina I have achieved when on the treadmill. I can see the difference with the weights I am able to lift and the number of reps I can do. Besides, Jessica keeps reminding me!! My future goals as a member of Anytime Fitness are to continue on this healthy track and keep acting younger than I really am. I hope to continue to enjoy my workouts as much as I do now and to live a long and healthy life! Previous Post:Success Story- Marielle H.